Now you can enjoy the juiciest, most mouth-watering chicken you've ever tasted. This Vertical Chicken Roaster is so easy to use, just slide the chicken onto the non-stick stand and roast it in the oven. 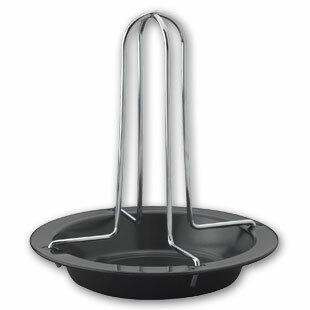 The vertical roaster infuses the chicken with flavor and moisture while evenly cooking from the inside out. This Vertical Chicken Roaster is guaranteed to produce crisp, juicy poultry with less work. Its special design sears the bird's inner cavity, locking in natural juices, while fat drips away. Not only is cooking vertical healthier...it takes less time! Once you have experienced it you will never cook any other way!